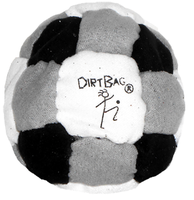 The Dirtbag 26-panel Footbag is very unique in design and another Flying Clipper original. 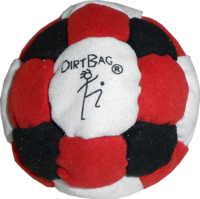 Combining octagons, squares and truncated hexagons and sand for the filler, makes this multi panel hacky sack a good choice for all kicking levels. 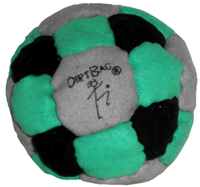 I've just only been kicking footbag for about 2 weeks and after trying the Dirtbag 26, my skill has improved immensely. 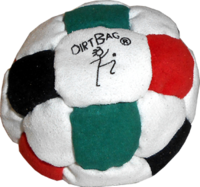 I have more control using this bag because of its compactness. After breaking it in I really got the groove. 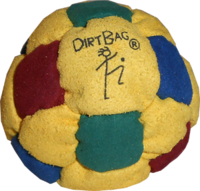 Its a great size for learning new complicated tricks. 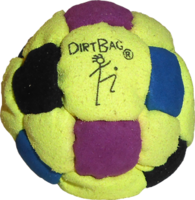 The colors of the bag make it fun to watch while playing. 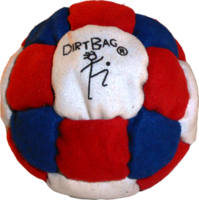 Works great and will purchase again!